The traditional Thanksgiving dinner is a root vegetable feast: Mashed potatoes and sweet yams are two dishes you’d expect to find alongside the meal’s de rigueur roast turkey. Courtesy of At the Emperor’s Table, Mr. Valentino’s guide to home cooking and entertaining published last year, may we humbly suggest another accompaniment? 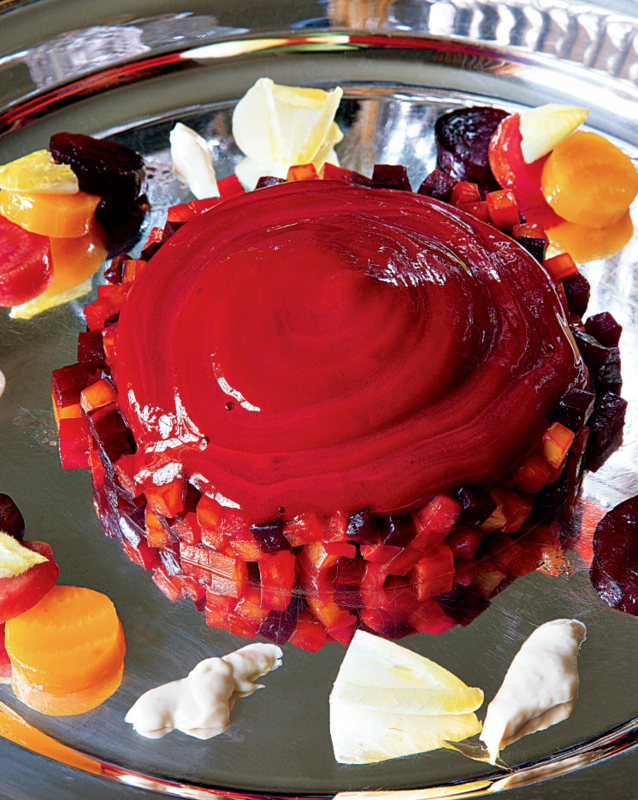 Multicolored Beets with Foam is often served at Mr. Valentino’s residence in New York City, and as well as adding a shot of classic Valentino red to the Thanksgiving table, it’s a lighter root vegetable option for those who’d rather not fill up on stodge. The dish looks haute indeed, but it’s less complicated to prepare than it seems. Beets, of course, are the key ingredient – one red, one yellow, one white. Pre-heat the oven to 400 degrees Fahrenheit, then wrap each beet in aluminum foil and roast until tender. (Usually, it takes about an hour.) Peel the cooked beets and chop them roughly—leaving a bit of a bit of each color aside to dice into fine slices for the garnish. For the foam, heat five gelatin leaves in a bit of raw beet juice, then stir this mixture into a bowl filled with approximately 2 cups of the juice. Add two tablespoons of raspberry vinegar, season lightly with salt and pepper, then pour the mixture into a soda siphon and carbonate twice. (If you don’t own a soda siphon, which allows you to make your own seltzer, there are good, inexpensive versions available from vendors such as Williams-Sonoma and Amazon.) Then, chill the double-carbonated liquid in an ice-water bath—without removing it from the siphon. The last step is the easiest. Arrange the chopped beats in a low pile at the center of a platter, drizzle with olive oil and balsamic vinegar, season with a little more of the salt and pepper, and add the chilled foam on top, in much the way you would if you were icing a cake. Then, take the remaining diced beets, and scatter them around the side of the platter, along with a few endive tips, if you wish. Apply the same small amount of olive oil, balsamic, salt and pepper to the vegetables arrayed on the platter’s side, and presto! 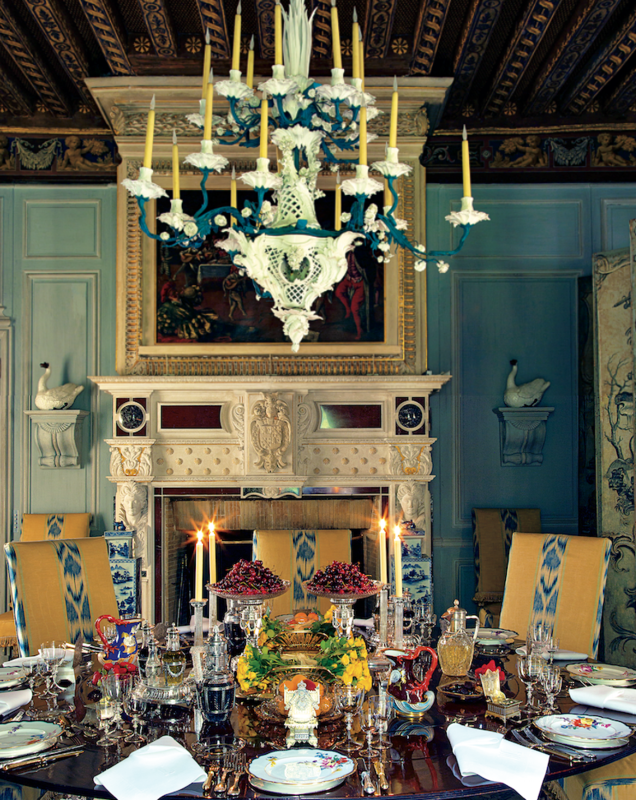 Thanksgiving a la Valentino.